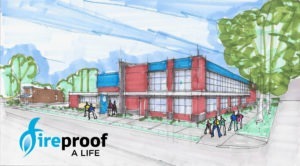 Home > News > Fireproofed Community Center 75% There! Fireproofed Community Center 75% There! The book of Daniel tells the story of three youths in the fiery furnace. Because of their faith in God, those three boys from Israel were shielded from the flames that were meant to destroy them! An angel of the Lord stood beside the three and prevented the fire from harming them. Phase I expected to be completed in July 2019! someone standing beside them through it all. This legacy project will build a functionally restored community facility where fireproofing kids’ and families’ lives can flourish. 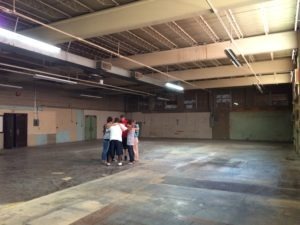 We thanked God for this former printing company facility in 2015 and began praying for how to use it to reach more kids and adults. 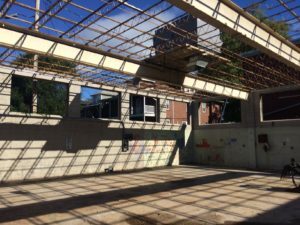 It was quite amazing when we visited the inside and saw what certainly looked like a space for a gymnasium – tear out some walls, literally “raise the roof,” and voila! We have a gym to be used for athletics and many other activities. This would become Phase I of the expansion project. Schematics were developed, funds raised, and construction began on Phase I. We were inspired when the roofing was removed, looking into the beautiful sky; “The Light of the World” caused us to reflect on the image of these kids and adults coming to experience the reality of the real light of the world, our Savior. Phase I renovation of the former Printing Company property, consisting of the gym, multi-purpose rooms, computer lab, restrooms, reception area, outdoor play area and parking, will be completed by July 2019. We experienced significant delays with PennDot and PPL that extended our completion date by six months. Fundraising was launched in fall 2018 for Phase II to finish the Community Center project. Phase II will demolish the existing 110-year old Youth Center and build a new two-story building (architecturally sensitive to the old firehouse). The Youth Center is not economically feasible to renovate – bids from several contractors came in $500,000+ over budget, so we determined that the wisest way forward is to demolish and rebuild. Phase II will provide space for elementary-aged kids, multi-purpose rooms for activities for all ages (including seniors), and kitchen facilities serving the entire site. The overall project cost is $2.8M for both phases; $2.1M has been raised to date, (including a wonderful $250,000 grant from the Boyd Foundation). We still need $700,000 to complete Phase II. The year 2019 is being devoted to trying to raise these funds, building on the momentum of completing Phase I. Material and labor donations are expected to reduce the remaining $700,000 price tag. We have been approaching major donors for Phase II matching gifts of $25,000 with the goal of receiving twelve such gifts; so far, we have received four $25,000 matching gifts. Eight more ($200,000) plus the match ($200,000) will raise another $400,000 toward the $700,000. We thanked God for this former printing company facility in 2015 and began praying for how to use it to reach more kids and adults. A targeted appeal to churches, businesses, and some additional foundations should raise the remaining $300,000 before the end of 2019. As you reflect on your giving to Bethesda Mission during 2019, I ask that you prayerfully consider a gift toward Phase II of this legacy project. Your gift toward this project – “Fireproof a Life” – will help prevent kids from going down a path that leads them to one of our shelters. The value and impact of Bethesda’s Community Center on the northern section of Allison Hill, and Harrisburg overall, is hugely significant. We would welcome the opportunity to personally give you a tour of the Community Center if you have not yet visited the site. Please don’t hesitate to contact us to set one up at 717-257-4442 or info@bethesdamisson.org.